Death occurring due to accidents in course of performance of duties. Death occurring in border skirmishes and action against militants, terrorists, extremists, sea pirates. Death occurring while on duty in the specified high altitude, unaccessible border posts, etc. on account of natural disasters, extreme weather conditions. 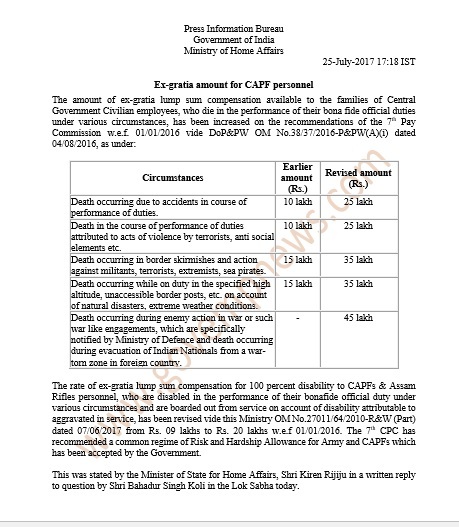 The rate of ex-gratia lump sum compensation for 100 percent disability to CAPFs & Assam Rifles personnel, who are disabled in the performance of their bonafide official duty under various circumstances and are boarded out from service on account of disability attributable to aggravated in service, has been revised vide this Ministry OM No.27011/64/2010-R&W (Part) dated 07/06/2017 from Rs. 09 lakhs to Rs. 20 lakhs w.e.f 01/01/2016. 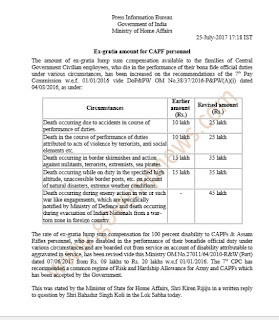 The 7th CPC has recommended a common regime of Risk and Hardship Allowance for Army and CAPFs which has been accepted by the Government.